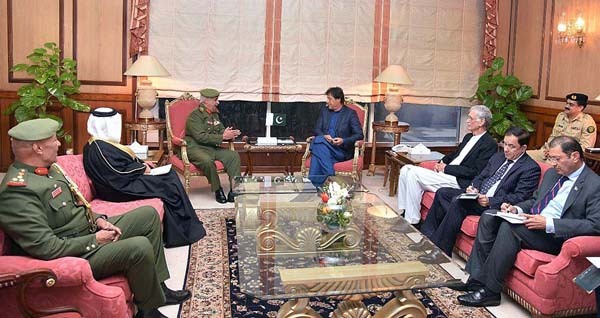 ISLAMABAD, Mar 19 (APP):Commander of the National Guard of the Kingdom of Bahrain, Lieutenant-General Sheikh Mohammed bin Isa bin Salman Al Khalifa, paid a courtesy call on Prime Minister Imran Khan on Tuesday and discussed issues of mutual interest including regional situation. The prime minister said Pakistan values its fraternal ties with Bahrain and had an abiding interest in further augmenting these ties in all spheres. He also expressed satisfaction on the existing level of bilateral cooperation, particularly in the field of defence. Lt. General Al Khalifa extended invitation on behalf of the prime minister of the Kingdom of Bahrain, Prince Khalifa bin Salman bin Hamad Al Khalifa, to the prime minister of Pakistan to visit Bahrain.